Right now, networking may not seem like the highest priority on your “to do” list. It may even seem a little awkward, time consuming and unnecessary. We all know the importance of pouring “blood, sweat and tears” into our business for continued success and the thought of going to a new networking event may be unappealing initially, but networking is an essential part of sustaining and growing a business. Try to remember, most of the people at the networking event started off feeling some level of anxiety and probably understand exactly how you are feeling. Connecting with other attendees who overcame their fear or shyness and embraced the community is not only inspiring but empowering. Setting goals is an excellent way to help you focus on your real purpose for attending the evet, which, for me, is lead generation. 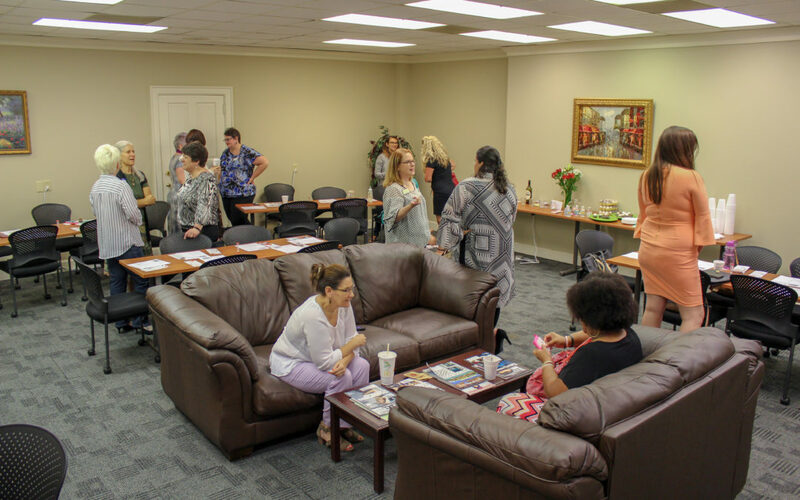 Making specific goals, like “meet three new connections relevant to my business” or “learn more about marketing my business” can make the event more fun and valuable to your specific business. It will also give you the motivation to stay when you find yourself migrating towards the door. While it probably won’t benefit you to memorize your elevator speech, having a few icebreakers ready will make a huge difference when walking up and striking up a conversation. Unlike other social events, it’s not a bad thing to get straight to the point! Asking people “What brought you here?” can build a conversation about your shared mutual interest. Ultimately you are there to help grow your business in some way so don’t hesitate to share your reason for attending. You will likely end up getting way more benefit out of the event than you hoped for, and you never know who else has similar goals or resources that may help you in your business. Building up the community benefits everyone, so be open to working with others on projects or events. Don’t forget to relax a little. Networking shouldn’t be painful or miserable, and a lot of people actually gain personal friendships from business networking. Be sure to keep in contact with the attendees you really connected with, starting with a quick follow up within a couple of days following the event to keep the momentum going. Once you make one connection the next connection will get a little easier, and before you know it, networking events will just be another (valuable) aspect of your work week. Above all, make the best of it, and don’t underestimate the power of connections!